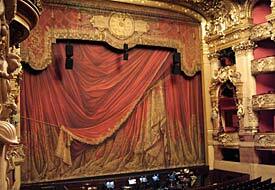 ABOVE: The trompe d'oeil curtain of the Opéra Garnier (which is really a flat curtain with painted folds). INSET BELOW: Views of the main façade and its statuary. The Opéra Garnier or Palais Garnier, still known to many as the "Paris Opera," was the world's largest theatre and opera house when it opened on January 5, 1875. The cavernous building, designed by Charles Garnier, was one of 171 proposals submitted in an architectural competition in 1861. The Palais Garnier took 14 years to build, with its completion being delayed by money troubles, the Franco-Prussian War (when the building was used as a warehouse), and a fire that gutted the interior and killed a fireman in 1873. The Palais Garnier wasn't an immediate hit with critics or with the public: Its Second Empire grandiosity was considered over the top by some. Empress Eugénie, wife of the third Napoleon, is reported to have asked Garnier: "Whatever is this style? It's not a style! It's neither Greek, nor Louis XVI, nor even Louis XV!" Garnier is said to have replied, "No, those styles are outdated. It's Napoleon III. And you complain?" Whatever the building's style, it was well-suited to opera, where architectural excess goes hand in hand with extravagant costumes, florid music, and the oversized egos of singers and wealthy opera patrons. Today, however, opera (in the tradition of Elvis) has left the building: The Opéra Garnier is now used mostly for ballet and modern dance, with grand opera taking place at the modern Opéra Bastille, which opened in 1989. The best way to visit the Opéra Garnier is to attend a performance. If that doesn't fit your schedule, you can visit the building or take a tour. There's also a museum with impressive displays of costumes, drawings, and set models. See our Opéra Garnier Visitor Information page for hours, ticket prices, and directions. Note: In case you were wondering, there really is a man-made lake beneath the Opéra Garnier, though no phantoms have been spied recently. The subterranean pond is now a reservoir and training facility for the city's pompiers-sapeurs, or firefighters. ABOVE: The Place de l'Opéra and Palais Garnier at night. Hours: 10 a.m. - 5 p.m. (usually until 6 p.m. from mid-July until early September). Closed during performances, and the last admission is 30 minutes before the building closes. We suggest allowing at least an hour, and preferably longer, for your visit. Admission: €12 for adults, reduced rates for students, children under 10, and other special groups. You can buy tickets in Paris or book online. Tours: Guided tours are offered in English sevedral times a week. See the Web site (link below) for a current schedule and booking information. 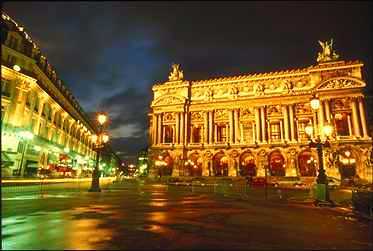 Location: The Palais Garnier occupies the north side of the Place de l'Opéra in the 9th arrondissement. It faces the Avenue de l'Opéra, which angles through the 1st and 2nd arrondissements until it reaches the Louvre. Transportation: The closest Métro station is Opéra, which you can reach on Lines 3 (pea-green on the official RATP Métro map), 7 (pink), and 8 (lavender). The nearest RER stop is Auber, on Line A. Bus lines also serve the area; routes are shown on the RATP Paris Tourisme map and the pocket-size Plan de Poche map, which are free at Métro and RER stations. Nearby attractions: The Opéra Garnier is close to Fragonard's Perfume Museum (free admission) and Paris Story, an audiovisual show that may be of interest if it's raining or your feet need a rest. For more information: See the Palais Garnier's multilingual visitor pages.